Often people think of checklists as short, uncomplicated forms. I found a lengthy exception in the field of real estate law in Canada. 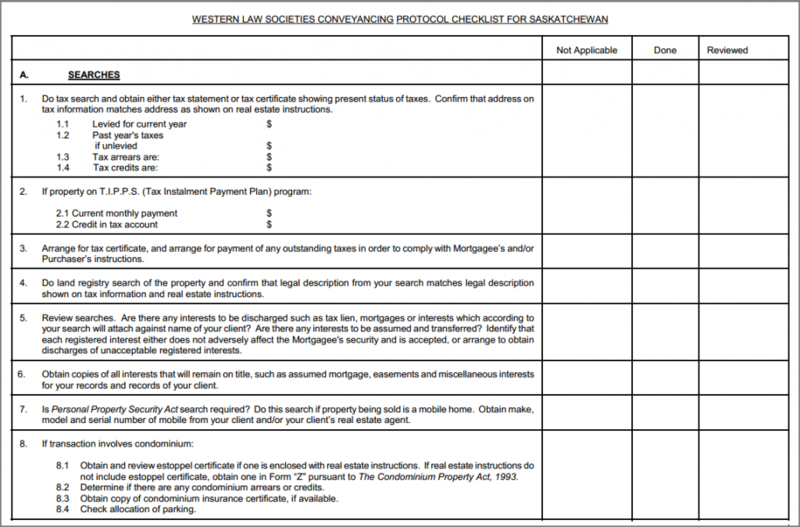 As part of its work, the Law Society of Saskatchewan developed a protocol checklist (2-page PDF) based on the requirements of the protocol. The image below is a portion of that check list; click the image to view the entire checklist (a PDF on the Law Society’s website). Solicitors (lawyers) working on certain real estate transactions (mainly transfers or refinancings for existing residential properties). As the Law Society of Manitoba says, each society’s protocol is a “practice guide” to help produce a solicitor’s opinion. To greatly oversimplify (I am not a solicitor, I don’t live in either Saskatchewan or Manitoba), the opinion is formal notice to the lender from the lawyer saying that the he or she has followed the protocol and and that the mortgage can be funded and the funds disbursed. In other words, it’s a highly specialized job aid intended for a limited number of practitioners in specific situations. A “not applicable” box reminds the person using the checklist to consider whether the item applies, and to confirm when it does not.